Despicable Me, the first 3D animated film from Universal Studios, is a fairly entertaining watch, with its main protagonist Gru masterfully voiced by Steve Carell. Although it’s got a predictable storyline, the film has enough moments for you to go ‘awww’. 1. The cover design is fantastic. 2. There are no special features on the DVD. 3. The sub-title of the film, ‘Superbad. Superdad’, pasted alongside a ‘gru-some’ looking man and three cute kids - almost gives the plot away. Gru (voiced by Steve Carell), an obnoxious inhabitant in a quiet neighbourhood, has an army of minions (egg-shaped characters with voices exactly like that of Vodafone’s Zoozoos) and a mad scientist helping him steal famous monuments. Well, almost. One day, when the Pyramids get stolen by Vector (Jason Segel), a new villain on the block, Gru is intimidated and plans to make the ultimate robbery - shrink the moon and bring it to earth. To help him succeed, Gru adopts three orphaned kids - Margo, Edith and Agnes. 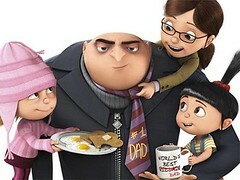 Almost from the moment the kids enter Gru’s life, the storyline gets extremely predictable. Several films, especially in animation, have gone down this pat. Monsters Inc., Ice Age are some examples that immediately come to mind. But despite knowing what to expect, Despicable Me is a fairly entertaining watch. This is Universal Studios’ first 3D animated film and although it’s not a Pixar product, the character design and animation is noteworthy. Some sequences - like the rollercoaster scene at the theme park - would look spectacular in 3D, nevertheless are enjoyable on DVD. But Gru's unique character piqued our curiosities the first time we saw the trailers and for many, that took us to the theaters too. Carell is fantastic as Gru and one can’t help but marvel at the immense work that must have gone behind getting the French accent right. So Gru does not sound like Steve Carell, rather it is the other way around. By any standards, that’s an achievement in voiceovers - something we marvelled at when we saw Robin Williams skillfully do it in Mrs Doubtfire. Writers Ken Daurio and Cinco Paul more or less succeed in showing Gru’s desperation to go to the moon, through his flashbacks to childhood. 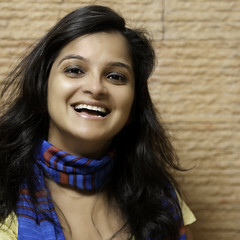 The humour in the film has a pattern - the antics of the minions are slapstick, while the kids, especially Agnes (Elsie Fisher) generate ‘awww’ moments with every line. Given the basic plot, parents will find certain scenes very easy to relate to mainly because of some parenting lessons Gru learns along the way. The closing sequence brings a smile to your face for simple joy it gives to celebrate the character of Gru. He looks, well... erm...disproportionate, but when in good company, he can dance really well. But it would be fair to say that without drawing too many comparisons, Gru and the kids’ antics are far better value for money than most movies that released this year. Violence: Guns, sharks and a robbery. Concept: A supervillian turning into a superdad. General Look and Feel: Pleasant, colourful and feel-good. I have a suggestion. I subscribe to your reviews by mail and generally use mobile net. It would be great if it is possible to get the full review of a movie in the notifier mail itself instead of anyone having to click on the link & coming here and then reading it. It's a little cumbersome you see, especially since Wogma doesn't seem to have a mobile version or it does, but my browser doesn't seem to render it. If not the full review, atleast the quick review part by which one can decide if the movie is worth a full review reading. @Kalyan I thought I had set it up so the whole review is in the email, let me check what's going on and fix it.